Chris Rock’s ploy to use the Oscars ceremony to help his two daughters sell Girl Scouts cookies may have been pre-planned, but it was the comedian who baked up the idea by initiating a conversation with the Girl Scouts of the USA two weeks ago. As host of Sunday night’s Academy Awards broadcast, Rock made a plea to the celebrities in the audience to buy cookies from his daughters and their Girl Scout troop. "I want you to reach into your millionaire pockets, and I want you to buy some of my daughters’ Girl Scout cookies," Rock said. "Are we going to deny my princesses from cookies? Alright, Tina Fey, get that money, girl. Charlize Theron, yes. Matt Damon, yes. Leo, you made $30 million — come on." Girl Scouts walked among the star-studded audience and raked in $65,243, selling cookies to the likes of Kate Winslet, Mindy Kaling, Jennifer Lawrence, Julianne Moore, John Legend, Matt Damon, Christian Bale and even VP Joe Biden. Rock made first contact with the group, reaching out directly to the leader of his daughters’ greater Los Angeles troop with the idea. Then the wider organization got involved, Girl Scouts’ director of communications Stewart Goodbody said. "The whole idea stemmed from Chris and his personal ties to the organization [through his daughters, who are Girl Scouts]," she explained. "He wanted to do something upbeat and positive during the telecast, so he reached out and requested our involvement with the Oscars." The original plan was that Rock would quickly mention the cookies and move on. But Goodbody said Rock did the unexpected and kept bringing the cookies up — even in the closing portion of the awards ceremony. "Having such extensive mention and visual of our girls selling cookies was a surprise," she said. "We thought it would just be one and done; we were very pleased." Girl Scouts’ social media team was "at the ready" to track and re-engage fans on social media during the event. The organization took to Twitter, Instagram, and Facebook to engage followers with "playful and fun" content related to the Oscars mention. 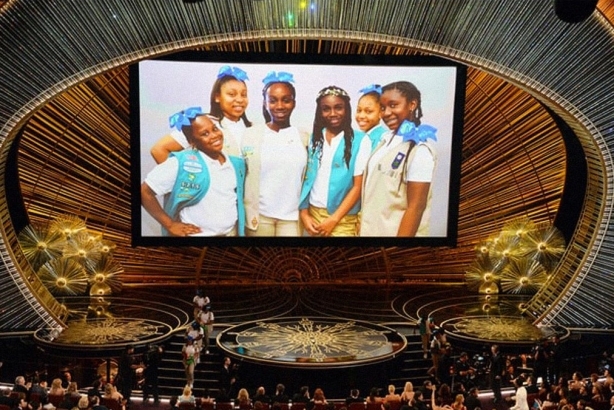 Goodbody noted that Girl Scouts of the USA received its highest number of likes and engagements on Instagram due to the Oscars promo. As a whole, on social, the organization received 24,800 mentions with a reach of just over 1.3 million. Celebrities who had direct interactions with Girl Scouts on social media relating to the event include Larry King, Cheryl Burton, Robin Roberts, and Brad Bessey. In addition, celebrities that tagged or mentioned the organization included Jamie Foxx, Aisha Tyler, and Olivia Munn. Numerous news outlets including Fortune, The New York Times, Fox News and US Weekly, also covered Rock’s Girl Scouts fundraising effort. "We expressed gratitude to Chris and all of the celebrities who were so generous by purchasing cookies during the event," said Goodbody of Girl Scouts’ response on social. "We were also mindful of communicating what the cookie sale really is all about." She explained that 100% of the net proceeds from cookie sales stay with local communities and the scouts decide how to spend their troop money. The troop that Chris’ daughters are in is using their earnings to provide foster children with school supplies, as well as "expanding their own horizons through educational trips," added Goodbody. "[He] did such an amazing job, shining a light on our cookie program and giving girls a chance to practice the entrepreneurial business and interpersonal skills they are learning by selling cookies during one of the most watched events of the year," she said.